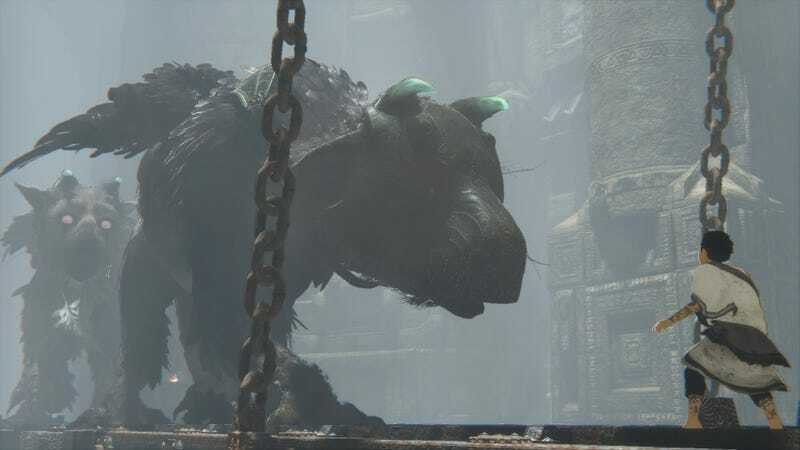 It’s been nearly 10 years since development started on The Last Guardian, designer Fumito Ueda’s long-anticipated follow-up to Ico and Shadow of the Colossus. I caught up with Ueda at E3 to talk about his lengthy journey. The last time I interviewed the 46-year-old designer was several jobs ago. I’d been sent to Japan to cover the Tokyo Game Show for the now-defunct TV station G4. Back then, The Last Guardian was coming out on the PS3. These days, it’s for PS4, one that was meant to come out many years ago. The finish line appears to be in sight. At E3, Sony announced The Last Guardian is coming October 25. Based on my conversation with Ueda, he seems confident his team can hit that date; internally, it’s been the goal for a while now. Now, it’s a matter of squashing bugs and extra polish. I didn’t spend all of my 30 minutes with Ueda picking apart what took so long—based on what I’ve heard, much had to do with technical issues impeding Ueda’s design ambitions—and touched on a variety of subjects. How does it feel for the game to have a release date? Is that a relief? More pressure? Fumito Ueda: A little bit of the pressure has gone away, but I have to admit that while we announced the release date publicly, we’ve been aiming for that for quite a long time. We knew what we were going for. In that sense, it hasn’t really changed our outlook or the team’s outlook. We’re just going to keep on going at the schedule that we have been, so long as there aren’t any major problems along the way. Everything looks fine. Our team isn’t super excited about it, but all of us are looking forward to getting back to Japan and getting back to the grind and getting it out there for everyone. What is the focus for the team as you head towards October? Ueda: The game, as a whole, is complete. You can play it all the way through, from beginning to the end. Right now, we’re focusing on brushing up various parts and doing tweaks here and there—things like cut scenes, little events here and there. Just getting all those cleaned up and ready. How much of the game that you’re hoping to ship in October adheres to the original vision you had when you first started making it? Ueda: Speaking on just the vision, there really hasn’t been any changes. Basically from start to finish, we had a vision and we re-created it. The only primary difference is the level of resolution, the shaders—that sort of thing. We originally thought the game would be for PS3, but on PS4, it’s better than we expected. But vision-wise, it has remained consistent. To work on a single project for so many years, I imagine as a person and a designer, you’ve changed. Has what you’ve gone through personally impacted getting to the finish line on a project that has taken so long? Ueda: Well, obviously, over such a long time, there have been things in my personal life that have changed. But as far as connected to the development of the title itself, I really don’t think there’s been much of an effect. If there has been a change, I think it would be on little things here and there, I might have changed my opinion on. As far as the overall vision, I don’t think it really has changed much at all, regardless of the changes in our personal lives. One of the things that can be very difficult is when you start making a game, the first thing you have to come up with is “what kind of game do I want to play?” Then, you move from there. But the longer you spend in development, the more you forget that original impulse, ‘what kind of game I want to play?’ That’s something I take very seriously. I always take a point of reminding myself periodically ‘when I first started this, what was I aiming for? What was the game I wanted to play?” I continuously remind myself that along the whole process, in order to keep that consistent vision. How do you remind yourself? How do you go back to that place? Ueda: I don’t use any special techniques. Basically, I go back to my old notes [and] my old sketches from the very beginning of development. Reading over those, looking over those, tends to make it pretty easy for me to remember what I was going for. Just to give you an example, the more you play this game, the more you become too used to it. For example, with Trico. You might call Trico to come over and he doesn’t come over. Since I’ve been working on this in development for years upon years, I’ll go ‘c’mon, just come over.’ [laughs] I get irritated. Then, I have to remember: if I’m a player who’s never played this game before and they call Trico over and he doesn’t respond, that’s the more realistic response. Trico’s an animal that doesn’t follow logic, the logic that we humans would, so it’s actually a positive thing. That’s the thing that I always need to keep in mind. The longer you play, the more logical you tend to try and make things, and that’s something we have to resist. It sounds like one of your fears over making the game for so many years was losing perspective of what it’s like to experience it as a player, as opposed to a developer who sees it every single day. Ueda: Absolutely. As a developer, you’re focused a lot on the technology, and as the technology improves, you can do more things and that improves the game. But in the end, what’s most important is the players who’s never played this game before and they pick up the controller and have this experience. What experience do you want them to have? What experience do I want to have and share with other people? I think that’s been central to us the whole way. Do you remember what the first germ of an idea was that’s taken up so much of your time? Ueda: First, with Ico, we lead with the visual aspects and it lead to a title from there. With Shadow of the Colossus, we started with the climbing mechanic, climbing on the backs of the colossi. When Shadow of the Colossus was released, I initially thought that the important relationships in the game were the man, the woman, and the colossi. But many players actually were strongly involved with the horse; they felt that relationship was a very powerful relationship in the game. That was a bit of a surprise to me, personally, but from that experience, that relationship between human and animal, that this is something really emotionally connect to, we thought that maybe, if we put that as the center of the game, more people would be able to get [a] greater emotional connection to it. Yours fans are extremely passionate with your games, especially Shadow of the Colossus. I’m wondering if you’re familiar with the people who hack into the game to find things that you didn’t mean to be in the game? Deleted colossi, deleted environments. Ueda: It makes me very happy. Every so often, I’ll get emails or posts on Twitter saying “tell us more of the secrets, tell us what’s secretly there.” For me, I’m the developer. There’s no such thing as secrets! What are you talking about?! But I have to go back and remind myself what it’s like to be a player, when I was experiencing these things. When I played video games, I was the same way. I looked through every corner, I looked through every last bit of a game looking for something secret, looking for something new. That people would want to do that with my title, it makes me very happy. What were the kinds of games that you became so obsessed with that you wanted to break them apart and find all their secrets, even the stuff that the developers didn’t intend to? Ueda: This goes back—way, way back—to even the original Super Mario. For me, personally, [I enjoyed] looking for everything, trying to find hidden stages, trying to find that you wouldn’t expect to be there. Many of them were probably bugs, to be perfectly honest. But I always found them to be evidence of this surreal world behind the screen, that it gave depth to this world that I was interacting with. That’s why I would always look for things like that. If you your present self could talk to your past self, what advice would you give yourself about The Last Guardian, based on what you’ve learned? When we first started the project, I was looking back at my other titles—Ico and Shadow of the Colossus— [and] they took time themselves. They were not short development periods. The reason for that was the new technologies we were adding. In Ico, we had the holding hands mechanic. That was something new that required us to create new techniques to work on. With Shadow of the Colossus, it was the climbing mechanic, the riding. That took a lot of time. For The Last Guardian, we wanted to avoid that issue from occurring, so we said ‘we’re going to focus on story, we’re going to focus on game balance’ to create a game experience that people can enjoy in a shorter amount of time. So I think I would warn him that it wouldn’t be as short as you thought it would be. We thought it would take less time than the other titles did. Ico and Shadow of the Colossus focus on relationships between players and digital creations. What have you learned about helping a player develop a bond with them? Ueda: Being on the development side, it’s hard for me to feel the magic of the relationship with the other character because I know everything. In that sense, it can be difficult to think in those terms. I’ve always been of the opinion that computers are not just for doing complicated calculations that would be hard for humans to do. I’ve always wanted to use computers to create new worlds and new characters and new experiences. I think, over these past many years, leading up to today, we’ve reached the point where computers can do that and we are doing that. That’s been something that I’ve felt going through these years. What are some of the other games you’ve played that have caught your eye? What games are doing interesting things? Is there a particular genre that you’ve found interesting? Ueda: If we’re just talking in genres, I’m really interested in VR and the move toward VR. As a developer, I started thinking about the business of it. How do we sell this sort of thing? How do we work with that? Then, I step back and think of it as a player, and the idea of using VR to completely immerse yourself in a virtual environment. That’s something that’s really interesting to me, and that’s something that as a gamer, I’m really looking forward to being able to do. In that sense, I think I have a lot of interest in VR and where VR is going. One of my goals with creating these games has been different from a lot of other games, whose purpose is you kill a lot of enemies and you feel satisfied and you’re excited and you’re happy. You get those emotions from playing it. My goal has always been to give players an experience—a virtual experience—of this world we’ve created behind the screen. I want them to enter this world, I want them to interact with this world. In that sense, virtual reality is the logical extension of what I’ve been trying to do all these years. With virtual reality becoming a thing faster than I thought it would be, I’m surprised virtual reality has reached the point that it has. But again, the reason VR is so interesting to me is that it truly is a logical extension of what I’ve been trying to do all this time myself. How do you plan to celebrate when The Last Guardian is done?